Ryan Armour may have been at the top of the Sanderson Farms Championship leaderboard when play ended Sunday, but he wasn’t the only one leading the way. Allen Exploration CEO Carl Allen and wife Gigi were leaders in philanthropy, announcing a surprise $500,000 donation to the Campaign for Children’s of Mississippi during the Allen Exploration Pro-Am Pairings Dinner Tuesday, the same day Sanderson Farms Championship winner Armour, along with fellow golfers Austin Cook and Shawn Stefani, visited patients at Batson Children’s Hospital. The gift was among the highlights of this year’s tournament, the state’s only PGA TOUR event and a major supporter of Friends of Children’s Hospital. Dr. Mary Taylor, interim chair of pediatrics, knows how much these gifts can help improve the health of sick and injured children. 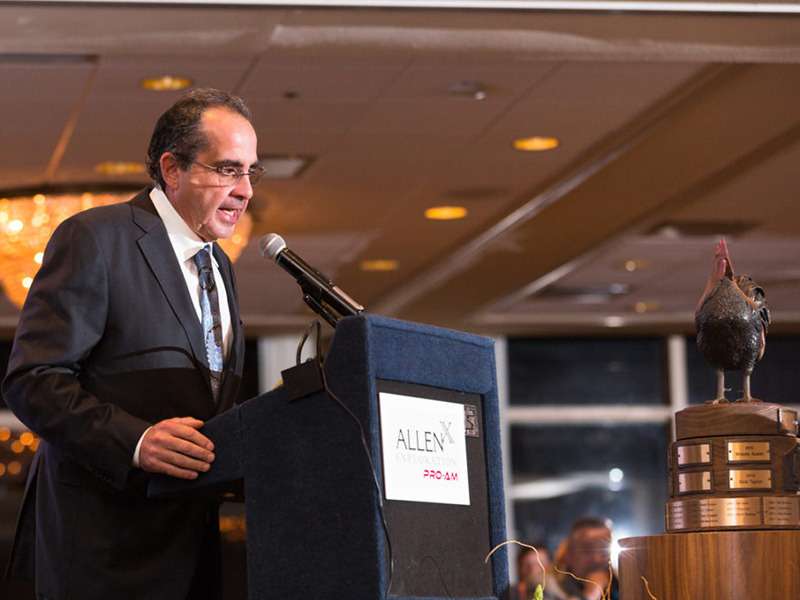 Tournament host Century Club Charities donated $1.125 million to Friends from the 2016 tournament. The nonprofit dedicated to raising funds for Batson Children’s Hospital has pledged $20 million to the Campaign, a $100 million fund drive for expansion of pediatric facilities at the University of Mississippi Medical Center. Plans for the expansion include a new children’s tower with more space for neonatal and pediatric intensive care units, additional surgical suites and an imaging center designed for children. An outpatient clinic offering specialty care is planned to be built nearby. Joe Sanderson, CEO and board chair of tournament sponsor Sanderson Farms, and his wife Kathy have led the way for other philanthropists in the state by chairing the Campaign for Children’s of Mississippi and making a personal pledge of $10 million. The Campaign, launched in April 2016, has raised more than $58 million so far. PGA golfers, from left, Ryan Armour, Austin Cook and Shawn Stefani fall victim to Batson Children’s Hospital patient Keydarius Taylor’s UNO skills during an Oct. 24 visit. The Championship’s competitors support its connection to Children’s of Mississippi. On Tuesday, it brought three of them to the third-floor playroom of Batson Children’s Hospital. There, Keydarius Taylor, a Batson patient from Meridian, was teaching golfers Armour, Austin Cook and Shawn Stefani a new game, the card classic UNO. A few “Draw 4” cards here and there gave Keydarius a sizable lead. Gymnast, author and television personality Shawn Johnson East and her husband, professional football player Andrew East also stopped by. Ready for Shawn, who won an Olympic gold medal on the gymnastics balance beam in 2008 and was the featured speaker at the tournament’s Women’s Day luncheon, were patients including Orenzo Dye of Greenville, who had crayoned a drawing highlighting Shawn’s win on ABC’s “Dancing with the Stars” in 2009. 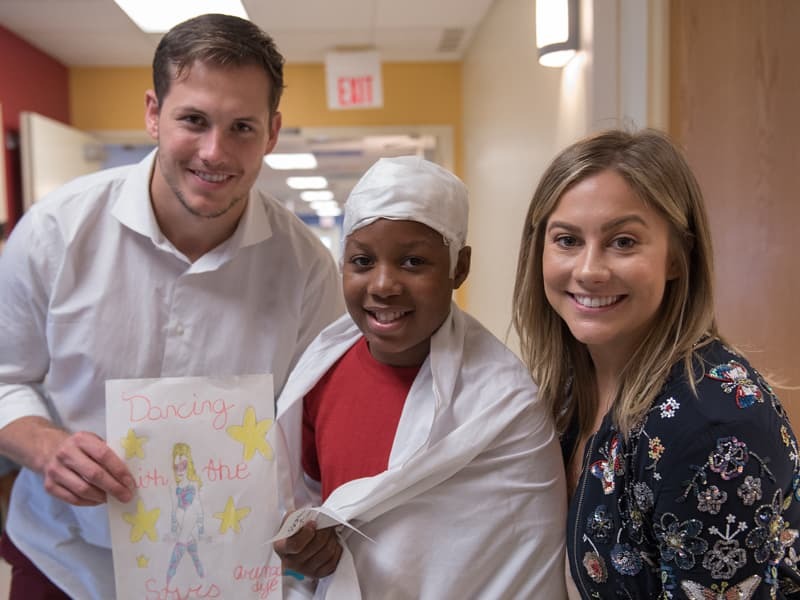 Orenzo Dye of Greenville, a Batson Children’s Hospital patient, shows a “Dancing with the Stars” drawing he made for Shawn Johnson East, a winner of the television ballroom dancing competition. At left is East’s husband, Andrew. Maggie Hanberry, a Batson Children’s Hospital patient, had her own copy of Shawn’s book, “Winning Balance: What I’ve Learned So Far about Love, Faith and Living Your Dreams,” ready for an autograph. Fresh from his UNO game with Keydarius, Cook was ready to tee up in support of the state’s only children’s hospital. “I couldn’t be more excited to play in this event and be here to support all these children,” he said. Children’s of Mississippi families returned the favor during the tournament, greeting and thanking spectators. Among them were Jacob Partlow and his mother Olivia Partlow of Canton. Jacob, 2014 Children’s Miracle Network Hospitals Champion for Mississippi, has battled leukemia since 2009 and is now in remission. “We will always make time to help Batson Children’s Hospital,” said Olivia Partlow.